Vail Daily column: Time to build new parking? The town of Vail has maintained for many years that it needs 1,000 additional parking spaces. Current daily frontage road parking figures, however, indicate that 400 to 600 additional spaces could remove the need for most, if not all, frontage road parking (with the exception of the needs that would be generated by any supersized events). For even more years, structured parking has been a can that town leaders have been all too willing to kick down the road. This year’s community survey indicates that the can kicking should stop. 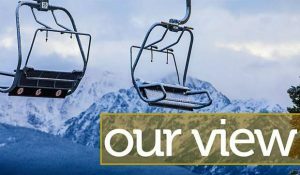 Time has shown that officials need to complete their obligation to keep Vail’s planning vision intact by adding more structured parking to the Vail Town Center commiserate with the increase in tourism yielded by the Vail Renaissance redevelopment, special events and summer mountain expansion. At the present time, Vail’s financing picture is very healthy; the debt from the current parking structures was retired in 2012, and it is reasonable to assume that an additional nearly $5 million per year could be realized if the present winter overflow was moved into a structure. 9,874 frontage road cars, plus the additional 9,232 vehicles that park on North Frontage Road at $25 per day. That sum, when added to the existing revenue that the present structures generate, could go a long way toward paying for a new structure — either by way of an addition to the Lionshead Village structure and/or a new structure on the Vail municipal site. The town has conducted numerous studies of how to build additional structured parking, but they have not done the analysis of what it will take to finance the most feasible options from either the general fund or through bonding. When the town has done an analysis, the structure parking is always tied to a proposed major public facility, such as a new town hall or conference center. The combined costs of parking and facility are high, which deters public support. The net effect is that the town of Vail’s inventory of public structured parking has not kept pace with demand. The Vail Homeowners Association suggests that this issue has been sidestepped long enough; the time for study and pushing down the road is over, and it is time now to get moving.